Like most of us, I try to read the entire internet on a daily basis but for some reason, these slipped through. They both came out in 2011 and I am sure the numbers have changed in many cases. For instance, the graphic shows 70+ domains registered every minute and for Sept 3 (thus far for today), on average 78 per minute have been registered. Yet for twitter, the chart indicates 320 new accounts per minute but my look up today, if my math is correct, shows 94 new twitter accounts every minute but with 546,000 (vs. 98,000+) tweets per minute today. Regardless, the somewhat, slightly dated info is still mind boggling and it is always fun to see historical data. 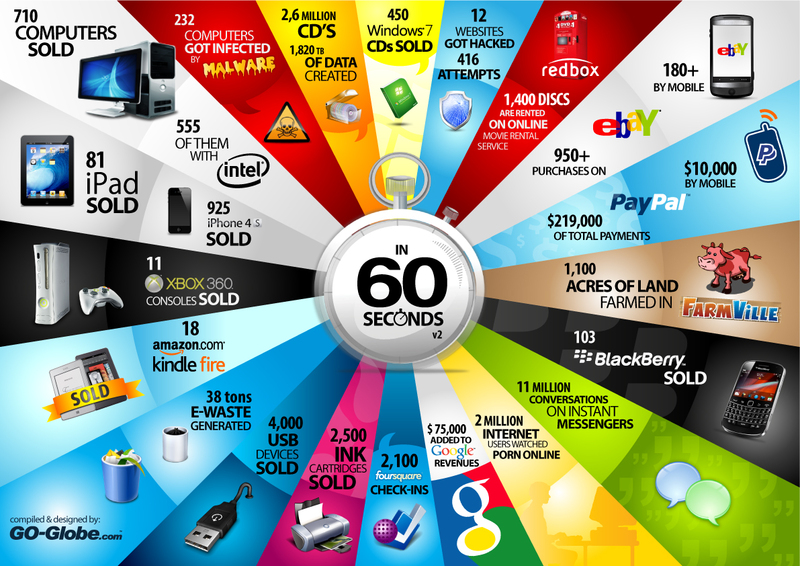 Things that happen on the Internet every 60 Seconds circa 2011.